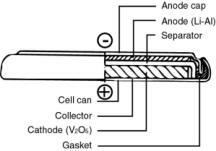 The button cell was developed to miniaturize battery packs and solve stacking problems. Today, this architecture is limited to a small niche market. Non-rechargeable versions of the button cell continue to be popular and can be found in watches, hearing aids and memory backup. The main applications of the rechargeable button cell are (or were) older cordless telephones, biomedical devices and industrial instruments. Although small in design and inexpensive to manufacture, the main drawback is swelling if charged too rapidly. Button cells have no safety vent and can only be charged at a 10 to 16 hour charge rate. New designs claim rapid charge capability. Figure 3-2: The button cell. The button cell offers small size and ease of stacking but does not allow fast charging. 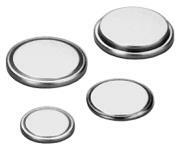 Coin cells, which are similar in appearance, are normally lithium-based and are non-rechargeable. Photograph courtesy of Sanyo Corporation; design courtesy of Panasonic OEM Battery Sales Group, March 2001. The prismatic cell was developed in response to consumer demand for thinner pack sizes. Introduced in the early 1990’s, the prismatic cell makes almost maximum use of space when stacking. Narrow and elegant battery styles are possible that suit today’s slim-style geometry. Prismatic cells are used predominantly for mobile phone applications. Figure 3-3 shows the prismatic cell. Prismatic cells are most common in the lithium battery family. The Li-ion polymer is exclusively prismatic. No universally accepted cell size exists for Li-ion polymer batteries. One leading manufacturer may bring out one or more sizes that fit a certain portable device, such as a mobile phone. While these cells are produced at high volume, other cell manufacturers follow suit and offer an identical cell at a competitive price. Prismatic cells that have gained acceptance are the 340648 and the 340848. Measured in millimeters, ‘34’ denotes the width, ‘06’ or ‘08’ the thickness and ‘48’ the length of the cell. Figure 3-3: Cross-section of a prismatic cell. The prismatic cell improves space utilization and allows more flexibility in pack design. This cell construction is less cost effective than the cylindrical equivalent and provides a slightly lower energy density. Design courtesy of Polystor Corporation, March 2001. Some prismatic cells are similar in size but are off by just a small fraction. Such is the case with the Panasonic cell that measures 34 mm by 50 mm and is 6.5 mm thick. If a few cubic millimeters can be added for a given application, the manufacturer will do so for the sake of higher capacities. The disadvantage of the prismatic cell is slightly lower energy densities compared to the cylindrical equivalent. In addition, the prismatic cell is more expensive to manufacture and does not provide the same mechanical stability enjoyed by the cylindrical cell. To prevent bulging when pressure builds up, heavier gauge metal is used for the container. The manufacturer allows some degree of bulging when designing the battery pack. The prismatic cell is offered in limited sizes and chemistries and runs from about 400mAh to 2000mAh and higher. Because of the very large quantities required for mobile phones, special prismatic cells are built to fit certain models. Most prismatic cells do not have a venting system. In case of pressure build-up, the cell starts to bulge. When correctly used and properly charged, no swelling should occur.